Albert Odyssey is a short game so I will likely be finished with it by Saturday. 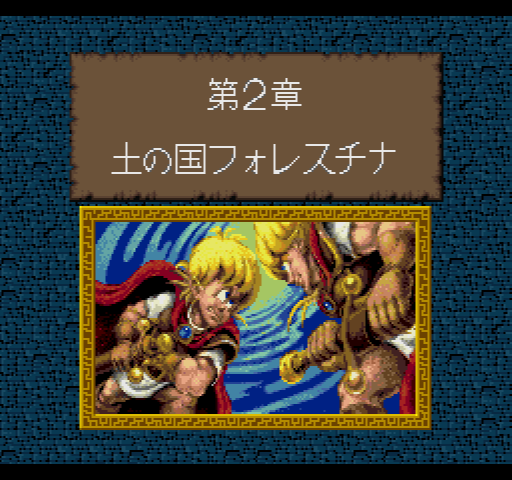 My copy of Metal Max 2 isn't going to get here until next week, so I'm going to do a little detour next week into the PC Engine (Turbo Grafx CD) archives and play Tengai Makyo Ziria. 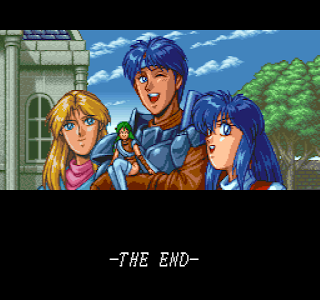 The PCE is a nostalgic console for me and if I had thought of it I would have probably done PCE before Super Famicom, but it's too late now. Instead I think I will dip into the PCE archives every so often (maybe every 3-4 games). When I play the PCE games I will only play each game for a week unless I want to extend that because I'm enjoying the game (rather than just for completion purposes). I got a comment (not on this blog) that my blog was too negative, and that I wasn't understanding enough of the early developers' time and money limitations. I have wondered whether I'm too negative at times, and I think there's always a question about whether old games like these should be reviewed how they seem in 2017, or how they would have seemed when they first came out. That's 1 good, 3 average, 8 bad, and 4 terrible. That's pretty bad overall, and maybe there is something to the argument that I'm being too harsh (Albert Odyssey is hovering in between Average and Bad for me right now). However, I'm not sure it's possible to put myself back in time to 1992. I was playing video games at the time, and I honestly don't know how I would have reacted to some of these games if they had come out in English. I was pretty starved for RPGs at the time, but I was also a kid who only got a few games a year. So there was a lot more reason to play a bad game, which is a different situation than 2017 where you can play all these games for free (or even if you want to get them for actual consoles they're pretty cheap). I know this was early in the SFC lifecycle and developers were still figuring out the new console, but I'm not sure that excuses the quality of the games. 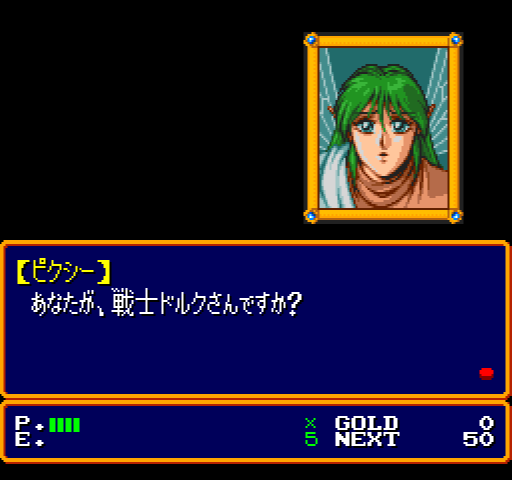 Light Fantasy sold for 8900 yen, which at the time was 71$ US. That's a lot of money to play for a game that's barely playable. It's not like the LF designers had no examples of SRPG-type battles to look at -- the battle system is worse than Ultima III, which was made 10 years earlier. Really all I can do is speak to my own enjoyment of each game, as someone playing these games in 2017. I try to give the creators credit where credit is due (I praised LF's graphics, for instance, and 3x3 Eyes had good music). But the fact that LF may have been rushed for time or money (it clearly was not tested very much) doesn't make it any more fun to play. 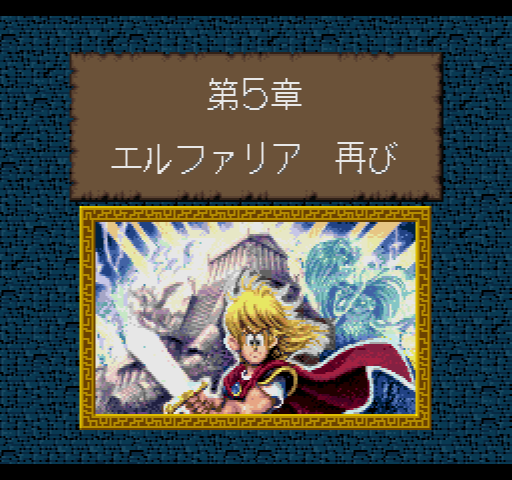 I mentioned this before, but I was very relieved at how much I enjoyed Dragon Quest V. I had started to wonder whether I had just played too many games to go back to these 25-year old RPGs and enjoy them. There may be something to that, but I still think I can find some fun standouts, and I'm expecting the general quality to improve as I get through the library. Xak is the first game in a series that began on the PC-88/98 and was then ported to various other PCs and consoles. 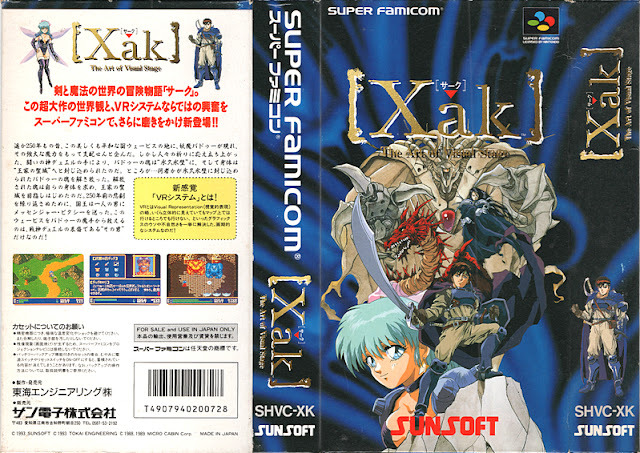 The Super Famicom only got a port of Xak I. The title is written in katakana as サーク, which would be Anglicized as something like "Circ" or "Sark". 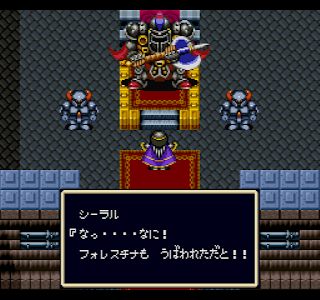 The subtitle "Art of Visual Stage" has nothing to do with the game itself, but refers to the graphical engine -- apparently in its initial PC-88/98 release the game was notable for its graphical engine that provided better graphics than other games which were able to show depth of field and such. 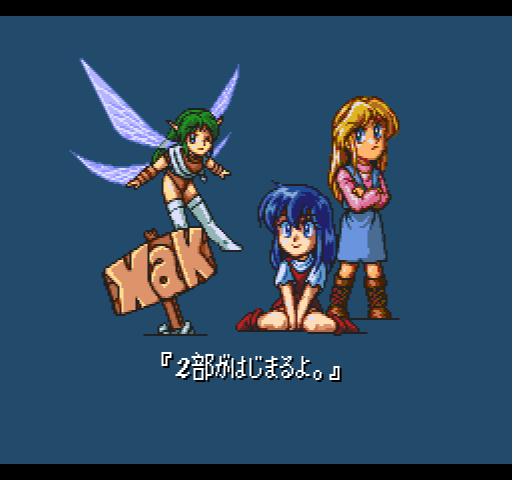 Xak is heavily influenced by Ys, to the point where it starts to cross over from "influence" to "ripoff". 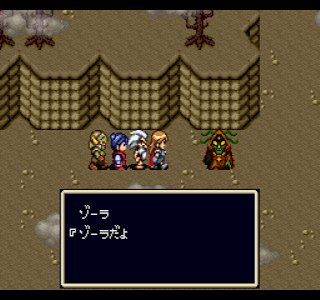 It's an action RPG with an odd-looking title, where the first story is split into two games. 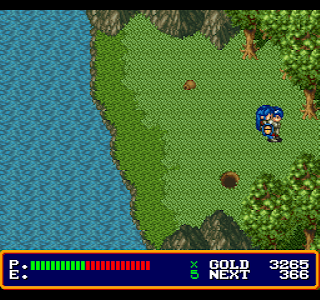 You run into enemies to hit them (in the original version) and it has a similar looking item and equipment screen. The feel of the games is very similar. The Super Famicom port of Xak I redoes the entire game, changing it from a "run into enemies" system to one where you actually swing your sword. It feels a lot like Lagoon in that you have to make sure you stand in the right place, and you can find yourself getting a game over very quickly. Fortunately you can save anywhere and on a game over the game immediately loads your most recent save, so progress is quick even if you die a lot. As in Ys, levelling has a huge effect on the game. Enemies that you start out barely damaging you can eventually hurt just by running into them. Unfortunately because only Xak I was ported to Super Famicom, you get an incomplete experience -- there is a final boss and some closure to the story but there are a bunch of loose ends, characters that barely serve any purpose (but will be back in II) and a final scene that teases the second game. This makes me wish I had started with Turbo CD games. As you can also tell from this post, the game is very short. I beat it in a little over 6 hours. 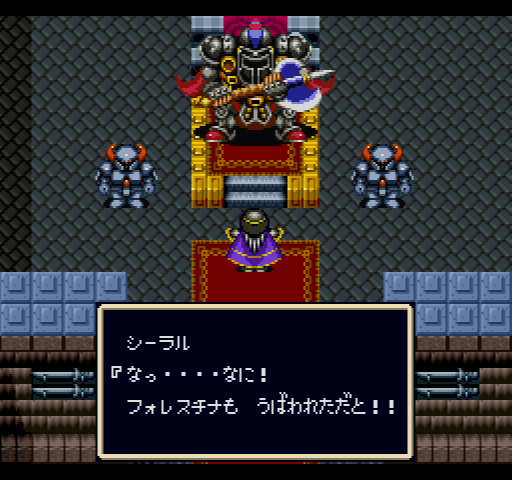 The main character is Latok, who as usual has the bloodline of a god (Duel). His father disappeared half a year ago, so when Pixie shows up to deliver him a message, Latok has to take it instead. 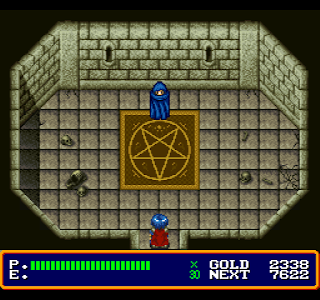 The father's name is "Dork"
The evil god Badu has revived because someone broke the seal to release him. 250 years ago he was defeated by Duel but now that Duel is no longer in the world, it's up to his descendant to destroy Duel. Pixie gives Latok the King's Seal and it's time for Latok's journey to begin. The first area starts off brutal. 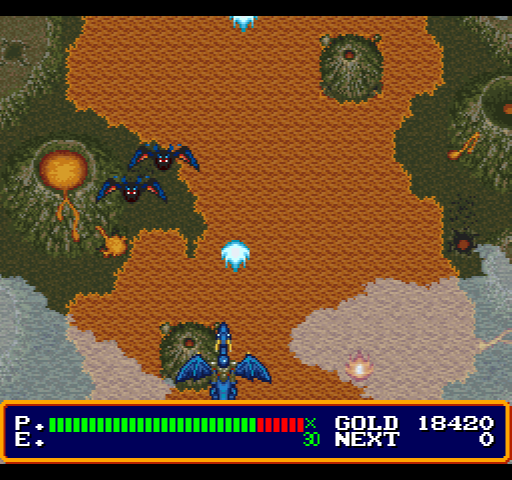 It's a pattern throughout the game that at first the enemies crush you, but after a level or two they're manageable. So the first part of the game involves exploring around, finding out where you can go (dying instantly is a sign you're going the wrong way). Eventually I found the Morul Fort, where an earthquake happened recently. One key to the game is that you often have to talk to people three times before they'll do anything. This fort also has lots of locked doors, but two of them can be opened by the people inside (who you can't see). I had to use a walkthrough to figure out what to do here, and also found out I missed an earlier boss because I didn't see the path. You can find Frey hurt in the forest. She has no further role in this game but she has her own side game and will join the main party in Xak III. 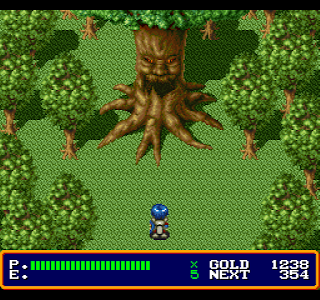 This is also the first boss battle, against a tree spirit. I was way too overlevelled at this point so he only took two hits. In the Morul Fort Latok finds a statue of Duel that tells him he needs three of the Xak Depuls, which will give him the power necessary to defeat Badu. Other than that your main goal here is just to get through the Morul Fort out to the other side, which involves fighting the second boss. This boss also went down in 2 hits. 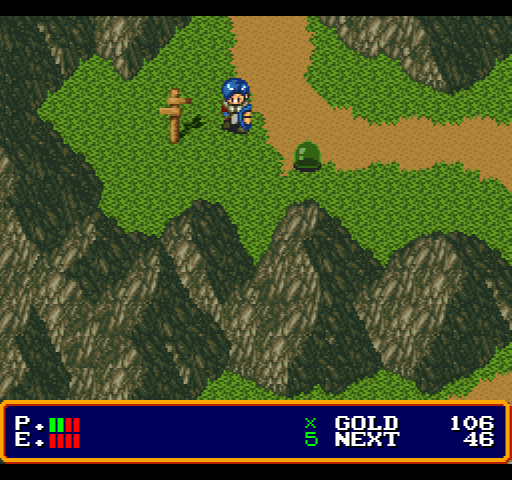 Now with the Blue Depul, Latok sets out to the next area, where he takes a mine basket down to a cave. After a few hits they combine into the Combine Elemental. Not a hard boss but it does a huge amount of damage so you do have to be careful. For some reason after this you get a scene where it replays moments from the game so far (less than 3 hours!) and then we're in "part 2". The game is not long enough for this. 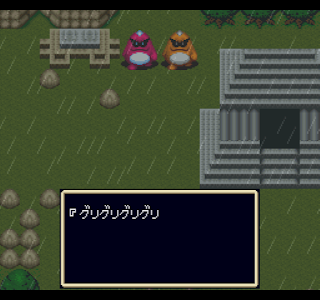 You come out in a Hobbit village (the Tolkien estate's lawyers can't read Japanese) and have to switch between here and the next dungeon, the large Zeglard tower. After finding a ghost, helping out some gnomes, and levelling a lot, we fight a boss called the Necromancer. All he does is summon undead, and then run after you beat them all. This allows you to progress into the next area, the Lava Zone. There is a small group of humans living here who help you out with information and items. Rachel's father went to the Flame Fort to find some medicine for their sick child, but hasn't returned. The fort itself requires a Flame Mantle to walk through fire curtains, and a gas mask to go through gaseous areas. Rachel's dad is in the fort but his leg is hurt. He gives Latok the medicine but has to stay behind. An old man near Rachel tells Latok that he needs a Dragon Ring to control a dragon at the top of the tower. 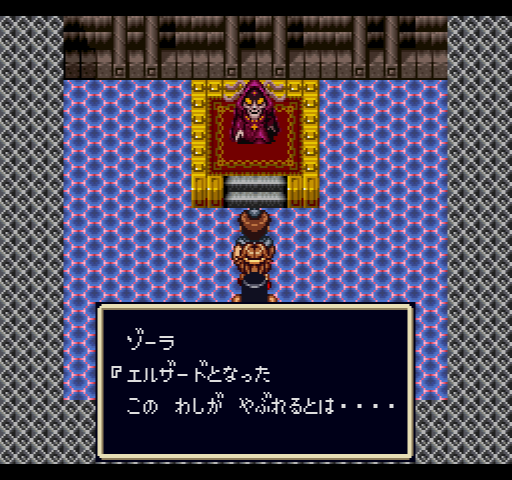 Up there, Latok suddenly gets the Red Depul from a box he picked up earlier in the game, and is given the Purple Depul soon after -- this is rather odd from a story standpoint. But now comes the worst part of the game. It's a shooting game. I hit the max level of 25 in the Flame Fort so there's nothing to do but try this over and over. The boss is really difficult, and of course you can't level any more. So this is essentially a pure action part of the game. I enjoyed Gradius and R-Type but those were much better than this. Your shots only do 1 damage, and only if you hit the head. 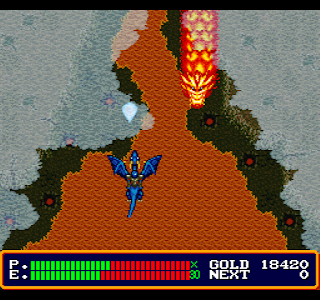 The dragon's movements are unpredictable and he often shoots out a whole bunch of flames in various directions. After a bunch of losses I passed this with heavy save state abuse. I can't imagine how long it would have taken me if I honestly started from the beginning of the shooting part every time I lost. I checked out some videos of this part on different consoles. This seems like the hardest one. 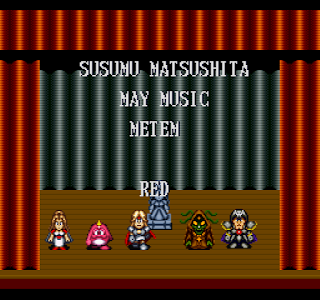 The PC versions are similar but seem to be slower moving (the MSX version adds an extra boss!) The PC Engine part is pathetic; the action area is very short and the dragon dies in one hit. In the next area is the final boss. He kills you in one hit, which is annoying, but he's not very difficult aside from that, despite his two forms. 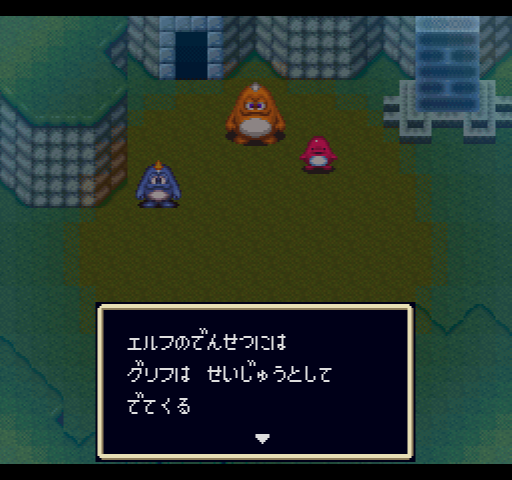 Badu tells Latok that his father is the one who released the seal, but he has no idea where Dork went. Then there's an epilogue where the Necromancer talks to a ???? person, and that's the end. Like I said, lots of loose plot threads and unfinished business. Overall the game's not bad other than the shooting section. But probably if you're considering playing this you should go with the PC Engine version so you can actually play the full story. 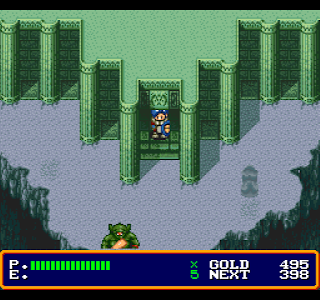 But the SNES graphics look a lot better. The music is pretty good, but it probably sounds better off the CD. Next up is Albert Odyssey, the first SRPG on this blog. Story/Characters: With 16 party characters in a game from this era, it's not surprising that there's almost no development for any of them. A few of them (especially the party leaders) get some story events, but even Pyne, the main character, doesn't get much. World: Standard fantasy, but the game gives you a good amount of lore through library books and monoliths that tell you about the past history. There are several different races. The areas blend together quite a bit but they have some individuality. Game Flow: This is a problem. The game becomes very repetitive and requires a lot of grinding -- also, because you need full or nearly full MP for the bosses, you have to go in each place multiple times to find chests and such, and then when you're ready for the boss you have to run from every fight, which can be very frustrating given the high encounter rate. This game really needs a way to restore MP other than leaving a town. The main reason this game took me so long to finish is that I couldn't play it for more than 30-45 minutes in a sitting before I got bored. This has made me consider an additional rule which I don't know if I'll actually use -- a 2 week limit for each game, which can only be extended if I'm actually enjoying the game. System: I commend the designers for trying something new, but in the end it just doesn't work. The auto-battles can be frustrating, especially when unlucky things happen like your healer getting frozen. I like the meld system, but I wish they had retained a normal XP-levelling system. The fixed level is an interesting idea, but the fact that they had to add a secret adjustment to each area based on how many battles you've fought seems like a patch over a flawed system. This is in effect a normal XP system but just implemented in an opaque manner. Many people will hate the auto-battle system. In principle I don't mind it, but I wish they had made it a little more complex with AI options and other things like that. It's frustrating to watch your characters get hit and hope your healer will cast a heal spell in time but have absolutely no control over whether it will happen or not. 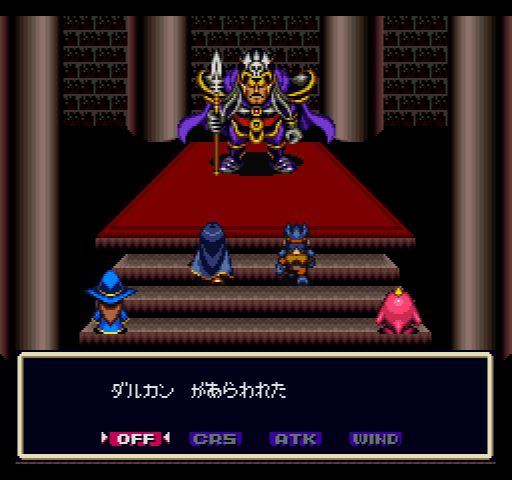 You don't have any feeling of gaining additional powers or abilities (because you aren't gaining any) so that the final boss fight feels exactly the same as the first random battle you encounter. This adds to the tedium and repetitiveness. Side Quests/Optional Content:Very little. At times it seems like there are some options, but the game always expects you to clear everything to raise your level, and sometimes when you have a choice you have to do one first because the other is too hard. Interface: Why are companies still refusing to include a unified "action" button? This is no longer a new feature that nobody knows about. Other than that the interface is fine. I like that you can heal with an herb by using the X button, and go instantly to the meld with the Y.
Graphics/Sound: The graphics are a strong point. Having a manga artist design characters always means they look more detailed and interesting than most games. 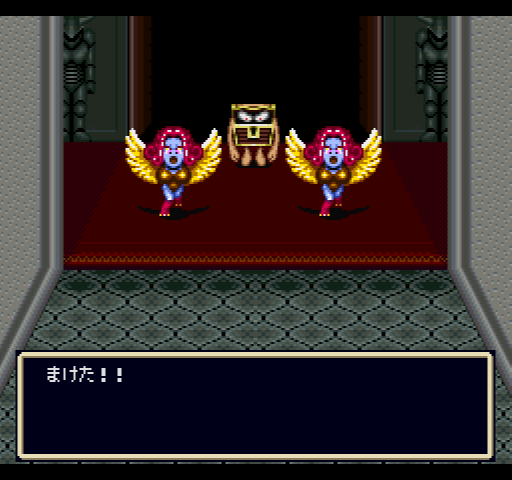 The monsters are colorful and detailed, and I like the victory dance they do if you get a game over. The locations are also vivid and interesting. The BGM is fine, but it gets old after a while since it's the same few tracks over and over again. I'm almost done with Elfaria; I don't know if I can finish it by today but I should have the final post up on Monday at the latest. 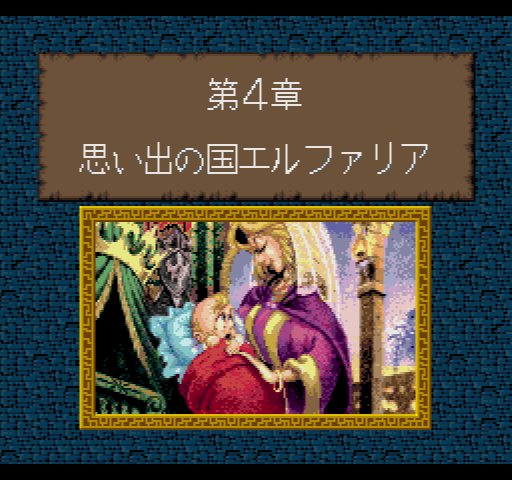 I'll post about the next three games after Elfaria, which I'll be skipping, then I can change the date of this post later and delete this section. 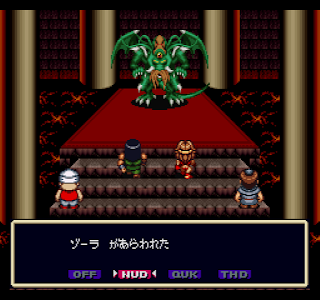 This was originally a PC88 game that was ported to a number of other computers and consoles, including the Super Famicom. This site includes it as one of the 9 worst SFC RPGs, and everything else I've read about it says that it's a bad port of a game that wasn't all that good to begin with. So I'll skip it. This game is listed as an SRPG on a few sites but it seems like a strategy game instead, and other sites classify it as strategy. It doesn't look like it fits my "named characters" criteria, at least. Skip. Great PC game, but I'm skipping all ports of Western computer games in this blog -- I've already played the PC version anyway. 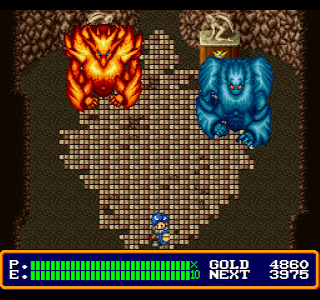 Zenic did the Genesis version, and the CRPG addict did the computer version. 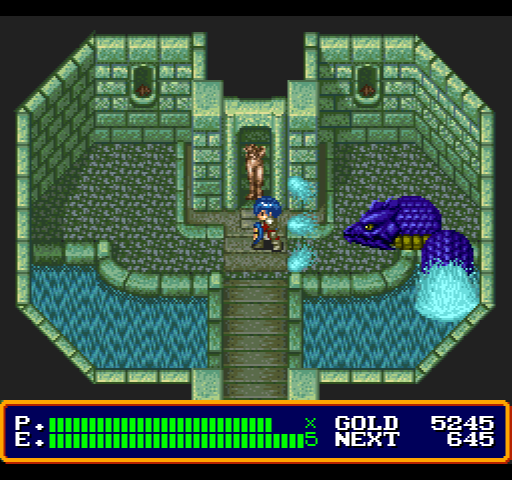 So next up after Elfaria is Xak: The Art of Visual Stage. This is a remake of a PC game but it's the first action RPG on the blog and seems decent enough, so I'll give it a try. OK, I finally finished the game. This took longer than I had hoped. 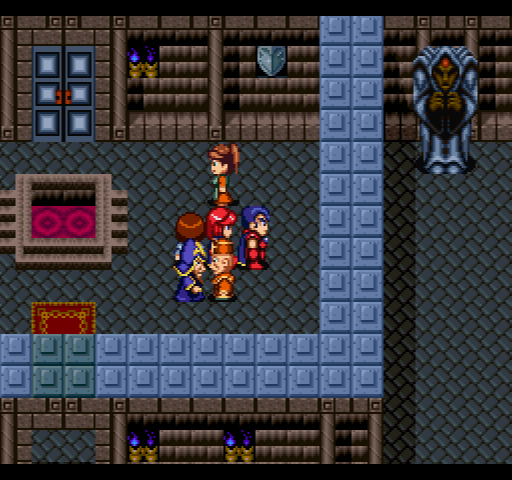 Chapter 4 takes us back to 15 years prior, as we attempt to stop Shiral from using the power of Ra to become Elzard. The map is the same as last time. Throughout this chapter the party meets younger versions of people from the last chapter, or childhood versions of themselves. In place 2 we meet Pyne's father the king, who is wounded and in prison. Pyne gives him an herb to heal before the duel he has to fight, but the king gives it to a sick boy instead and dies in the fight. 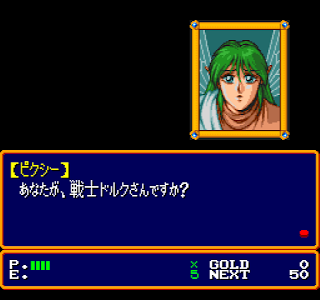 In town 4, Zora (who has also been sent back) sees himself trying to take the staff of Ra to Shiral, and thinks about how pathetic he was. 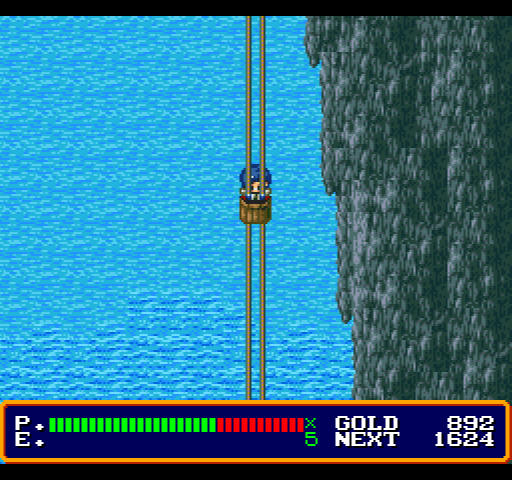 This section had a hard boss -- if the boss is tough there's not much you can do if you've already melded good stuff. Luck can help a bit, but that means going through the whole dungeon again. Zora goes to the Griff village at 8 and steals Papi (who is Sheena's friend) to sacrifice in order to call forth the Ra power. Town 10 has an annoying boss -- bosses that cause status effects like paralyze or freeze are annoying because if the effect hits your healer, you often lose because the healer can't heal your front line fighters. I think higher defense helps with this but it was hard to tell. Finally at 12, it turns out the Staff of Ra Zora has taken to Shiral is a fake. The future Zora switched it out for a fake one. After the party takes care of Shiral and heads back to the future, future Zora somehow combines with past Zora and then takes the Ra power for himself. Ell had thought that somehow Zora's love for Rishia would make him protect the heroes and be good, but that was a grave miscalculation. 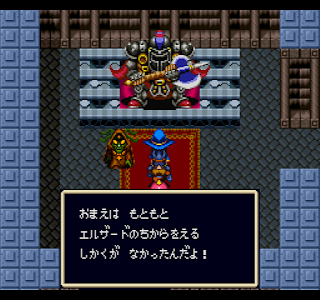 By the time the heroes return back in the present, Zora controls the world. 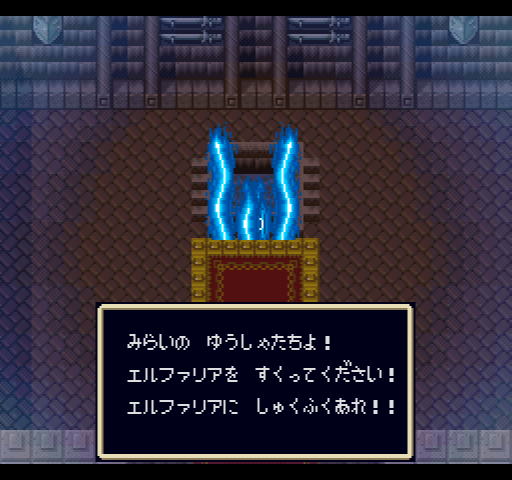 Chapter 5 puts us once again in Elfaria, this time in the Zora-controlled present. 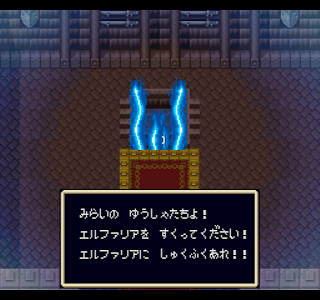 We need to somehow defeat Zora, which first involves recovering the Elzard Book and also getting the Zora Seal to stop the monsters in the area. 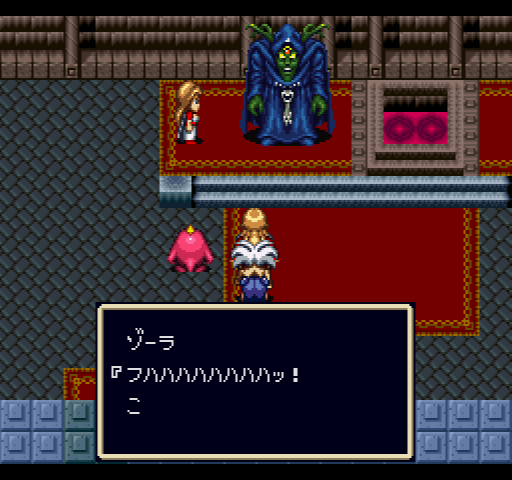 In area 4, Dalkam appears -- in this timeline Zora has turned him into a monster. 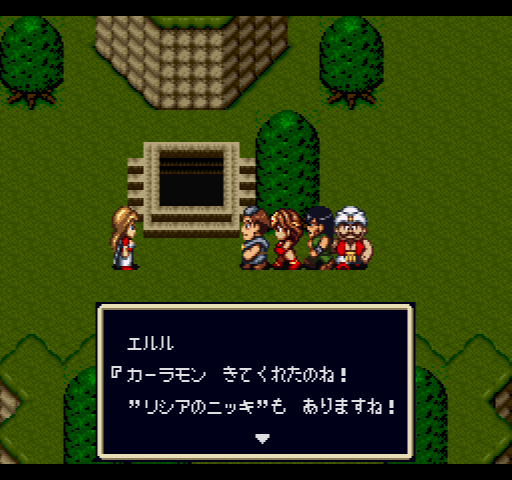 Dalkam wants to help the heroes somehow although they don't trust him. 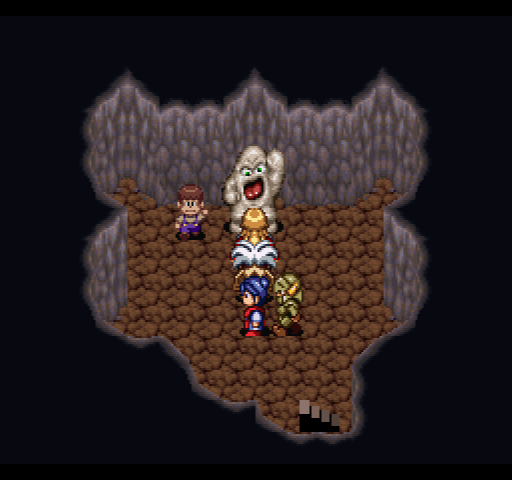 In location 5 he sacrifices himself to restore the Ra spring and help us find the Elzard book. 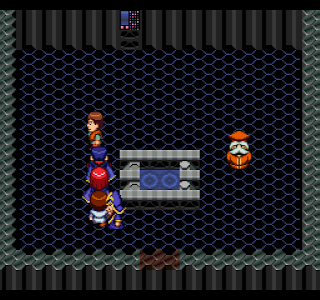 In area 6 we learn that Zora has killed the alternate timeline heroes except for Papi, who he's going to sacrifice to become Elzard himself. He has captured Ell. 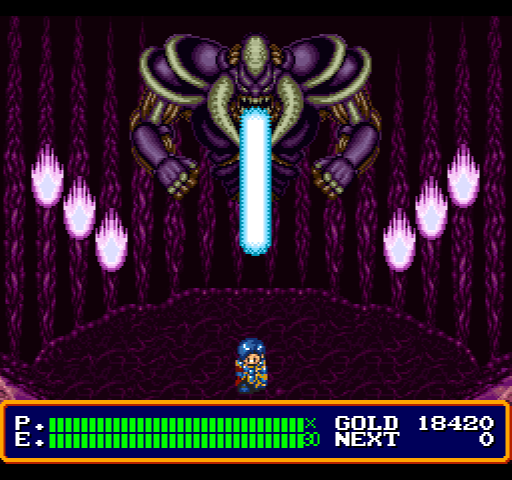 This finally happens in area 8 -- Zora sacrifices Papi. Ell tries to remind Zora of his love for Rishia, but he just kills her instead. 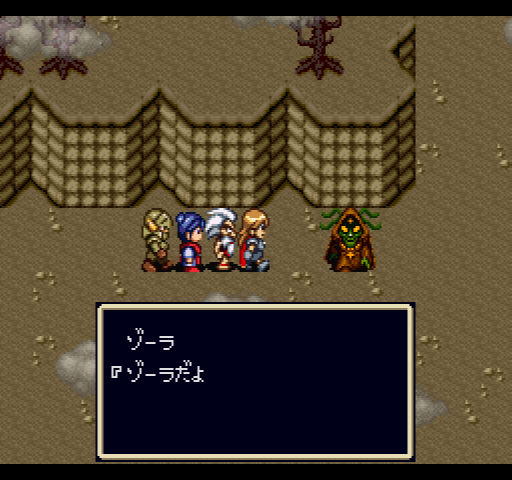 This does upset him enough that he retreats to Elfas, the final area. In area 10, Pyne meets the Elf Elder. 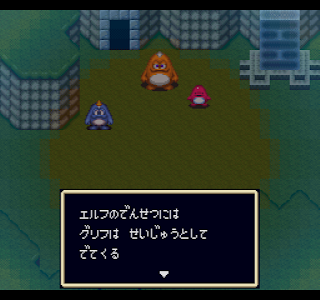 He was the one who sent Ell to help the heroes, and apologizes for the mistake with Zora (big mistake!!) 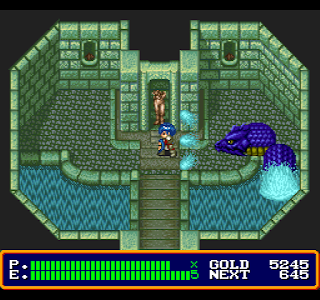 If we can meld the items described in the Elzard book, we can defeat Zora for good. 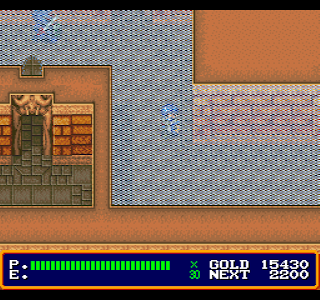 The final area doesn't really have any new story -- you meld the items and then make your way to the boss, who is pretty easy as long as you have both effects. Since different effects cancel each other out I found the best way to do it was the Fire Orb on one guy, the Spirit and Thunder orbs on another, and then all the other spaces taken up with Sword or Mail. 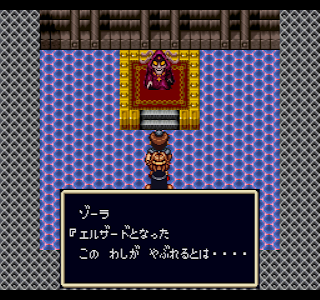 After Zora is defeated he turns back into his human self and makes one more statue of Rishia before dying, saying he'll go to hell where he won't see her. If this was supposed to be redemption it's not really very good. Pyne is now king, but decides he wants to be a scholar instead and goes back to study at his first village. 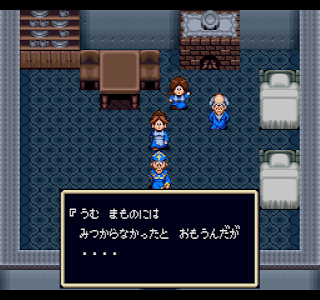 There are very brief scenes showing what everyone else does, and that's the end of the game. I don't have much to say about the gameplay because it's repetitive past a certain point -- the lack of options in battle means you're just melding items and then watching them fight. 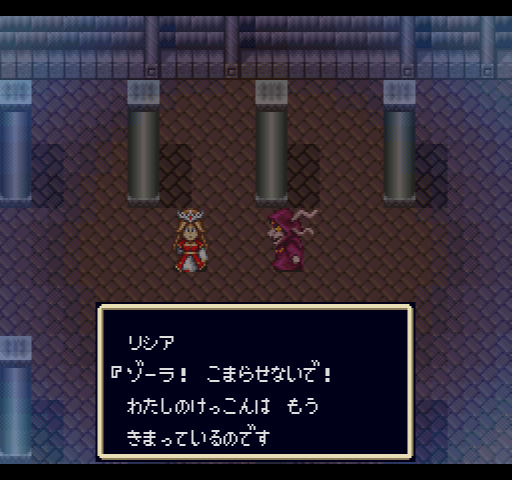 I'll say more about this in the review post, but ultimately this feels a lot like Romancing Saga to me. I commend them for trying something different from the usual RPG system, but ultimately I just don't think it works. At least I was able to complete this game, but I couldn't play it for very long in one sitting before getting bored. I'm not progressing in this as quickly as I would like. Although I feel like I'm generally enjoying the game, I can't play it for too long before I get tired of it, so I wonder whether I'm actually liking it as much as I think I do. 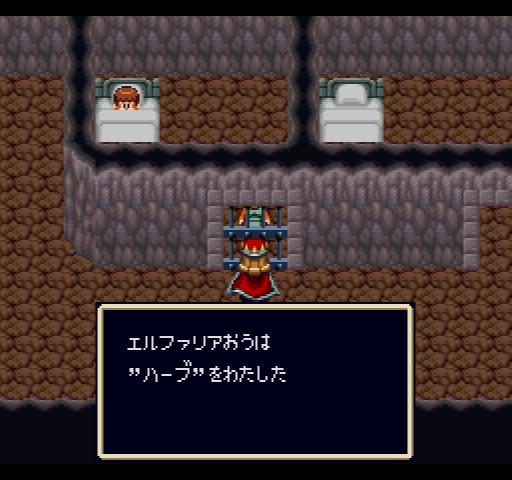 We're now in Murania, the country that destroyed Elfaria after Shiral's coup. Here's the map of the area courtesy of this nice walkthrough site. Ell is still trying to draw our party onwards, and she's now working with Zora as well. She tells him to make sure the hero parties don't die, but other than that his role in her schemes is unclear. Pyne is also confirmed as Rishia's son. This area brings us to the fourth and last party, the wind party of Sheena. 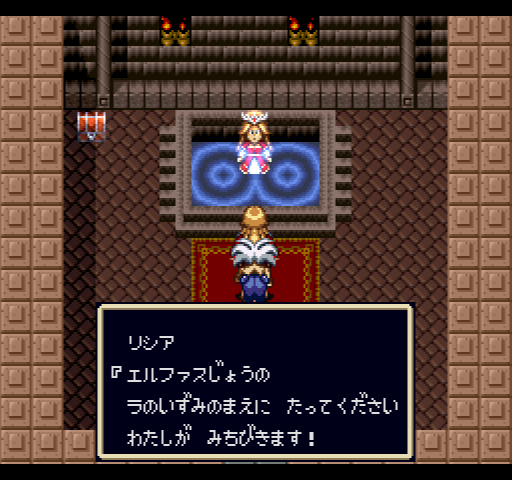 Her parents were killed 15 years ago because they helped the heroes, and she refuses to join us unless we can prove that we have the Elfaria King with us, who alone can use the King's Proof at the Zaza temple. The area also has a strange look to it that has computer-like wall fixtures, although there's no obvious sci-fi element yet. After we reach place 4 on the map, Pyne is able to use the King's Proof and so Sheena joins us. The main goal in this part is to pass the Boa Gate at place 9, but this involves beating two bosses at different towns. Fortunately helpful scholars give us items we can meld to make it easier. 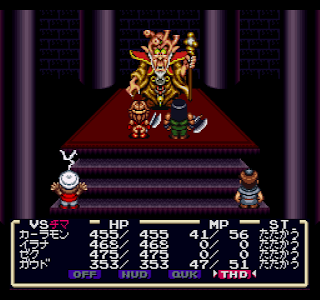 With these items the Younger boss was easy, but the Elder boss still required a lot of defense upgrades to defeat. Along the way, we actually meet Shiral at Murania. According to Zora, it seems that he stole the Ra Staff 15 years ago and used the power of the Ra Springs. This has eventually resulted in him losing control over it (Zora is surprised he lasted this long). Zora kills the weakened Shiral, but this doesn't stop the crisis the world is facing -- Shiral's use of the Ra Springs has caused earthquakes and other problems, and the world itself will soon be destroyed. Shiral also confirms that we are the same group of heroes that fought him 15 years ago. Rishia appears at the Boa gate to tell us to go to Elfas Castle and stand in front of the Ra Spring there, where she will lead us on. Dalkan is happy to see Shiral gone because he now controls the world, but of course we eventually show up to defeat him. As with the previous bosses, as long as you have the right party he's pretty easy -- in this case it's Sheena's party that will take care of him. At Elfas we also get to see the original rooms of Pyne's mother and father, and such. After the boss fight, Ell finally tells us what our role is -- we have to jump in the Ra Springs to go back 15 years and stop Shiral before he can carry out the ritual that first caused the Ra Power to begin weakening. There's no time to think about it because the world is literally being destroyed that moment, so we have no choice but to jump in the spring. I think part of the reason why I find the game hard to play for very long is that there's a certain repetitiveness in each area. 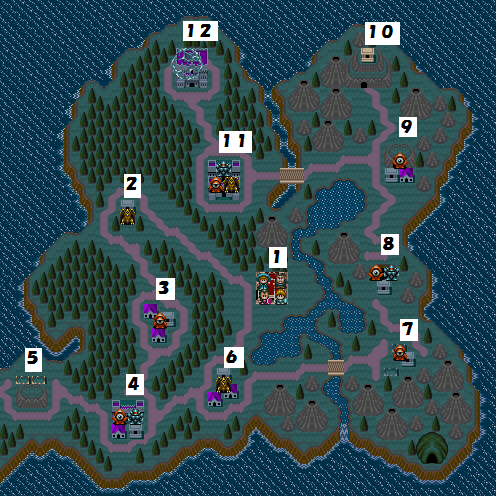 One big problem is the lack of any way to restore MP other than leaving an area. 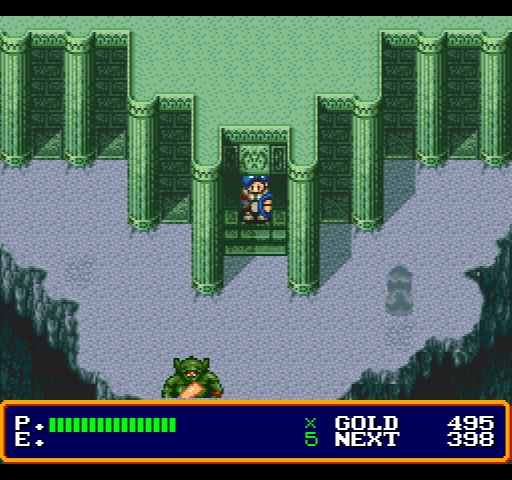 Since you need most or all of your MP to beat the bosses, you basically have to explore around for a few tries, then make a single trip to the boss where you run from every fight. Sometimes you'll be strong enough, other times you'll have to grind a bit before beating it. 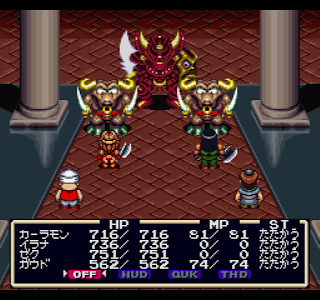 The battle system, while interesting, makes your stats so important that if you go into a battle not strong enough, there's really nothing you can do in the battle to overcome that. The choice of spells matters a little, but not that much. However, since losing carries basically no penalty, you can try even if you're not sure about your chances. The only downside is that Chima monsters can come from towns and try to move towards your captured cities to retake them -- but if you watch where the Chima are, you can always stop them. I was out of town from Thursday to today so I didn't play as much this week as usual, and the update is a day late. I'm still enjoying the game -- I think that as long as you can overlook the flaws in the game and enjoy the unusual gameplay it's not that bad. One additional gameplay element I discovered last time is that fighting random battles helps against the boss. The instruction manual mentions this but I thought they just meant it helped because you get items you can meld. 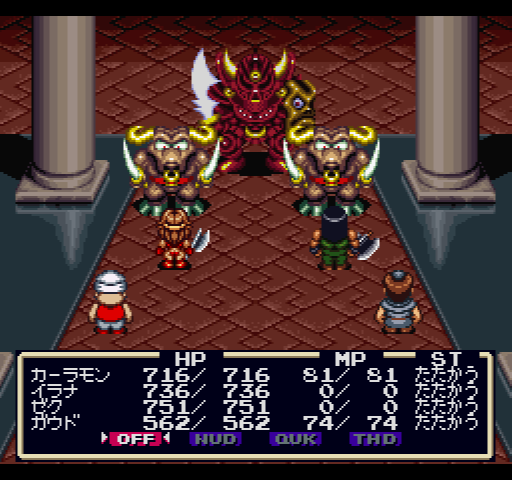 But a Japanese site I saw did tests and it actually increases your stats against the boss fight the more random encounters you fight in the area with the boss. So that means you really can't hit walls where you just can't advance. This is important because you can't go back to areas you've cleared and fight the monsters again, and if you beat one boss of a multi-boss area that kind of random encounter won't appear anymore so you can lose the opportunity to get items. 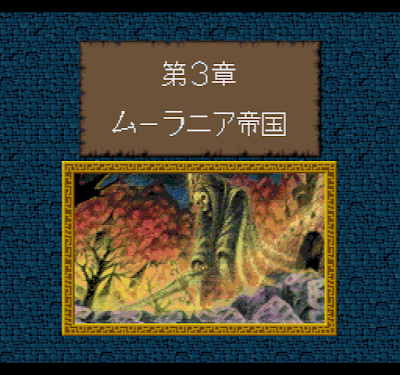 Chapter 2 is in the land of Forestina, and we quickly pick up the third party, the party of Earth. As you can see in the screenshot, there seems to be a mimic party we're following through this area. In this kingdom there are actually several ways you can go, but in the end it's still essentially a fixed path since you can't move too far ahead if you're at the wrong level. You can get some items, though. The main things that happen here is that we get the Earth piece and replace it with the correct gem, and then proceed through the area. Along the way we keep finding these history stones that give little bits of information about an ancient war between Elves and Humans. The big story section here comes in a library where you read about Zora's story. He's now working with you (sort of) against Shiral, who Zora thinks is going to destroy the world. Apparently Zora loved Rishia, the princess of Murania. But she had to marry Jozel, the king of Elfaria (I was mistaken in the last entry; Elfaria is one country of this world not the name for the whole world). Zora was exiled and wandered around, stole a magic book, and fomented a rebellion in Murania. Murania defeated Elfaria after the coup and Rishia was killed, but Shiral used ancient magic of Elzard to defeat the 16 heroes that came to oppose him. Zora still pines for Rishia and is always making statues of her everywhere. The boss of the area is Ag Uoo, who was impersonating Pyne (for no clear reason). He's not very hard with the Earth party. It seems like in general each boss is easy if you use the right party to take him on. Afterwards we learn that Shiral is having trouble controlling the power of the red springs found in each town, and Zora and Dalukan both think he's not going to last much longer. At the same time we learn that Pyne is probably Rishia's son. Sorry for the short update but I didn't play as much this week -- I hope to get through chapters 3 and 4 at least this week.